Getting straight to the point is always the best move, unless you're writing a novel, in which case you should get to the point no later than page 140, even if it means losing the subplot about the stuttering insurance salesman and the mysterious peasant woman. Get straight to the point of vodka, with Smirnoff 100. Smirnoff 100 is exactly what it says it is, a no-nonsense, 100-proof vodka, the kind of spirit one sips in between saying things like "Why is it so hard to believe that I've never been to the opera?" and "Like I really want to spend 10 hours watching a tiny fellow with hairy feet trek thousands of miles and face the evilest power in the universe, just because a bunch of full-height professional warriors were too afraid to touch a piece of man-jewelry?" Okay, maybe that wasn't so complicated. But it is boldly flavorful, and generally a good order anywhere vodka is served (so, pretty much everywhere). Find out more about Smirnoff 100's uncompromising attitude at the online headquarters of The No Nonsense Group -- guys who steer clear of both fizzy drinks and mullets, the rocking of which means you've lost the plot entirely. Vodka isn't some kind of game! Vodka is vodka. 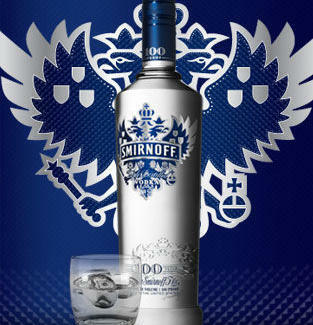 Get straight with Smirnoff 100 at Facebook.com. Please Drink Responsibly. Do not forward to anyone under 21 SMIRNOFF No. 57 Vodka. Distilled From Grain. 50% Alc/Vol. © 2010 The Smirnoff Co., Norwalk, CT.